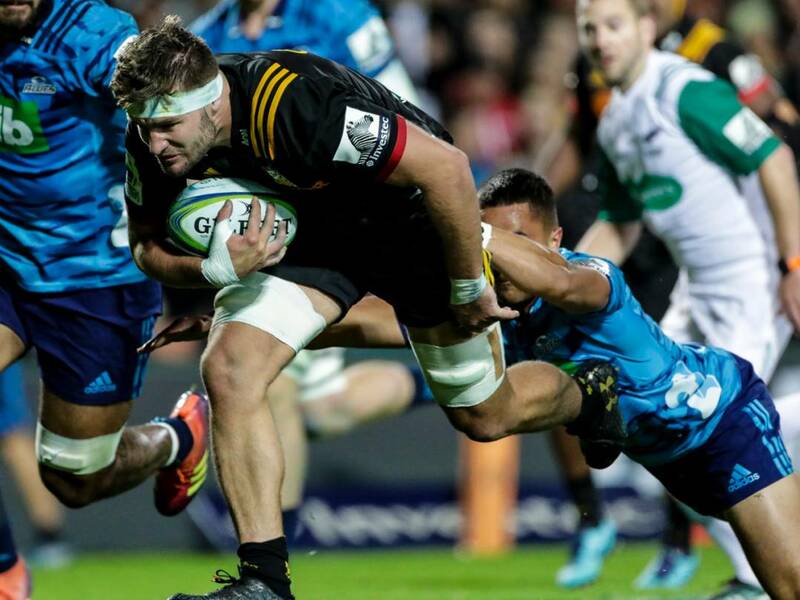 The Gallagher Chiefs have recorded their third straight win in style, coming out on top 33-29 at the end of a thrilling local derby against the Blues at FMG Stadium Waikato. In a match that swung from end to end with momentum shifting seemingly every few minutes, the Chiefs outscored the Blues five tries to four to notch up another four competition points that further helps their recovery from their slow start to the season. A positive start from the visitors saw them move swiftly onto attack inside Chiefs territory, and they came away with the opening points of the match with a penalty kick from first five Otere Black. After the Blues had done well to defend a promising period of Chiefs attack, they then conceded the first try of the night as halfback Brad Weber snatched an intercept 60 metres out and raced away untouched to score under the posts. With the penalty count mounting against the Chiefs, thanks largely to a dominant Blues scrum, the defence of the home side was asked some serious questions but they were able to survive the opening 20 minutes with their 7-3 lead in tact. After weathering the early storm, the Chiefs then turned on the style, launching wave after wave of attack which eventually ended in a try to loose forward Lachlan Boshier following a sharp run at the line from fullback Damian McKenzie. McKenzie added his second conversion to make it an 11-point lead after 26 minutes. The remainder of the first half was dominated by the Chiefs as they did well to keep applying the pressure on the Blues defence, but they were unable to add any further points with a missed penalty from McKenzie the closest they came. Right on the stroke of halftime the Blues struck back with a brilliantly worked try against the run of play, as Number 8 Akira Ioane made a break from inside his own 22 to spark his side into action, with the sweeping attacking movement finished off 11 phases later by fullback Melani Nanai. The Chiefs were dealt an early blow as play resumed with Damian McKenzie leaving the field with a knee injury. However his replacement Ataata Moeakiola got himself on the scoresheet just minutes later as midfielder Anton Lienert-Brown made a brilliant bursting run to set up the Chiefs' third try. With his brother off the field, Marty McKenzie stepped up to convert the try and stretch the lead back out to 11 points. The response from the Blues to the Moeakiola try was superb, as they worked their way downfield and applied pressure with back to back scrums five metres out from the Chiefs line. Eventually the defence was breached as veteran second five Ma'a Nonu burst onto a short pass and bulldozed his way over the line. The back and forth nature of the match continued as it was the Chiefs' turn to go on the attack and, after a fine piece of skill from wing Sean Wainui to pick up a loose ball and break clear, Boshier went across for his second try of the evening. Just 60 seconds later the Blues replied once more with Reiko Ioane spinning his way over in the tackle and dotting down just inside the left-hand touchline. Following the frantic middle stages of the second half, the Chiefs went in search of their fifth try to give them some breathing space, and after a patient build up it was replacement Jesse Parete lurking out wide who got over the line. The Blues were not done with yet, and their next attack proved relentless, going 17 phases to score with Nonu crashing through the defence for his second to set up a tense finish. The final minutes was all pressure from the Blues with the Chiefs hanging on desperately to their four-point lead. It took a big double team tackle from replacement front rowers Samisoni Taukei’aho and Ryan Coxon to turn the ball over, and from there the Chiefs were able to wind the clock down and seal the win. Gallagher Chiefs 33 (Lachlan Boshier 2, Brad Weber, Ataata Moeakiola, Jesse Parete tries; Damian McKenzie 2 cons, Marty McKenzie 2 cons) Blues 29 (Ma'a Nonu 2, Melani Nanai, Reiko Ioane tries; Otere Black 2 cons, pen, Harry Plummer con) HT: 14-10. The Gallagher Chiefs now look forward to a visit from the Lions from South Africa on Good Friday at FMG Stadium Waikato (19 April, kick off 7.35pm).